You must be a member of the Munich New Horizons Group to attend this activity. Would you like to join this group? Update 11.04. - PAYMENT DEADLINE is 16.04. ! As always: First paid, first served! 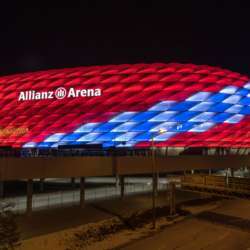 What makes the Allianz Arena the world’s finest football arena? Find out for yourself! Take an Arena Tour for a behind the scenes insight into this extraordinary and unusual stadium. Experience the atmosphere of the Allianz Arena from the point of view of a professional footballer in the players’ areas and discover the exciting details of this unique structure. This and many other highlights awaits you. After the Arena Tour we will have the possibilty to eat and drink in the restaurant. After that we will visit the Fc Bayern Museum (Duration approx. 1,5 hours). There is no refund but you can give your spot to somebody else. Please note! This activity will take place only if Fc Bayern is not playing in the Arena on that day. I will receive a final confirmation of the Tour approx. Protected content before activity starts. Full refund, if I have to cancel this activity.